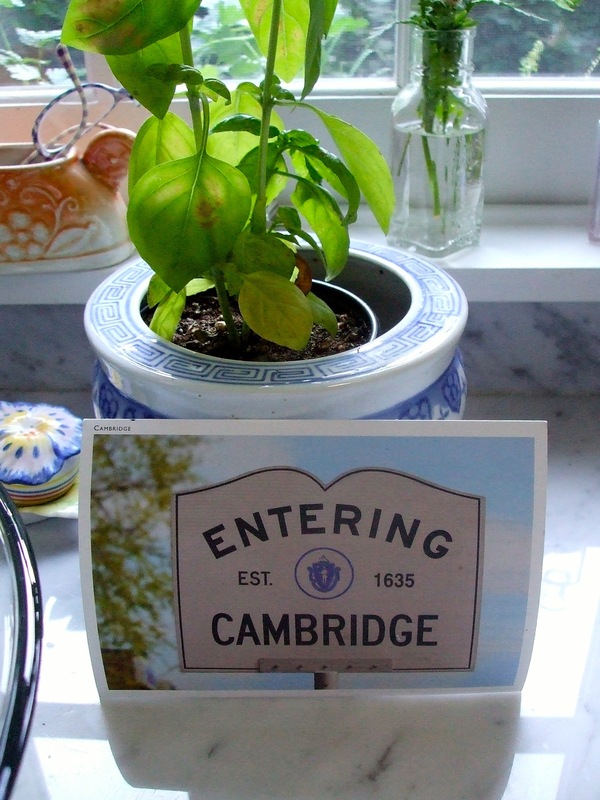 the “entering cambridge” postcard sits at the foot of my kitchen window, just to the left of the coffeemaker, just to the right of the cake dome, where the blue willow plate offers up the daily special. it’s a point on the domestic map that’s pretty much the epicenter of morning, noon and bedtime. at the top of the stairs, now nailed to the red wall in The Professor’s study, there hangs another version of the very same sign: “entering cambridge.” only this one is carved out of wood, hand-painted by a new hampshire craftsman. both serve as reminders, but more emphatically than that, they’re nudges, sharp elbows into the ribs. insistent “pssssst, you promised”s. if a sabbatical — a year of thinking sumptuously — is really meant to transform your life, it demands an afterlife. the intent is not simply to pry open your cerebrum, insert wisdom and knowledge, then suture the whole thing shut and send you on your merry way. the whole point, it seems, is to reshape, reframe, keep those brain cells ever open for business. ever famished. there’s a beautiful ritual in judaism that at the end of shabbat — the holy interlude from sundown to sundown, friday to saturday — a spice box is passed around as part of havdalah, the candle-lit blessing that seals the sacred time, the end of the otherworldly 25 hours. the box is filled with star anise and clove and cinnamon bark, pungent aromatics. the thinking goes that as you take a whiff, fill your nose down to your lungs with those spicy notes, you’ll so carry the sweetness of shabbat with you into the week. you won’t confine the holy to one short slot of time. you’ll bring the holy with you. so too sabbatical, a word with roots in sabbath, to rest, yes, but to restore, more emphatically. it seems that our end of the bargain is that as disciples of the sabbatical, we are duty bound to bring home its truths, its wisdoms, and plant its seeds into our home soil. i’ve long been charmed by the signs, posted at the entry point of every massachusetts town or burg or city. it might be the simple lines, the white crest, crisp black letters, the unassuming declaration of history in the middle line on each and every sign, “inc. 1635,” for instance, on the one for fine old cambridge, the city incorporated just 15 years after captain bradford planted his waterlogged boot on plymouth rock. the first sign i carried home, carried home in duplicate, if truth be told, was “entering amherst,” the town where we tucked away our firstborn when he went off to college. the wee signs, in magnet form, were talismans to me. i stuck one in my cubicle at work, tucked one in my wallet, as if bumping into the forms in the thick of a workday, or while slipping out a dollar bill, brought me close, if just for a moment’s time, to my faraway boy. quite simply, the signs charmed me. here’s the backstory: on massachusetts avenue in cambridge, there sits a fine old map store, tucked between an ethiopian cafe and a funky hair salon. we passed it every time we drove to the little guy’s school. he and i noticed the entering cambridge signs in the window. we had a hunch they were for sale. the little guy declared, on one of our winter drive-by’s, that we really needed to procure one for the professor, who’d already taken quite a shine to the fair city and whom we guessed might never want to leave. it became a refrain: we’d drive by on the way to school, on the mornings when the bus didn’t quite happen, and the little guy in the passenger seat would declare we needed to get a sign. so, at last, the week we were leaving, we did. we wrapped it, and left it beside the professor’s bed. so that, come father’s day morn, the day after we’d flown home, when the professor awoke alone in that third-floor aerie that had been our roost for all those glorious months, he’d find a stack of wrapped and ribboned packages. unbeknownst to us, the professor had been thinking along the same cambridge lines. lying on my pillow the last night i lay my head there, there was a postcard. 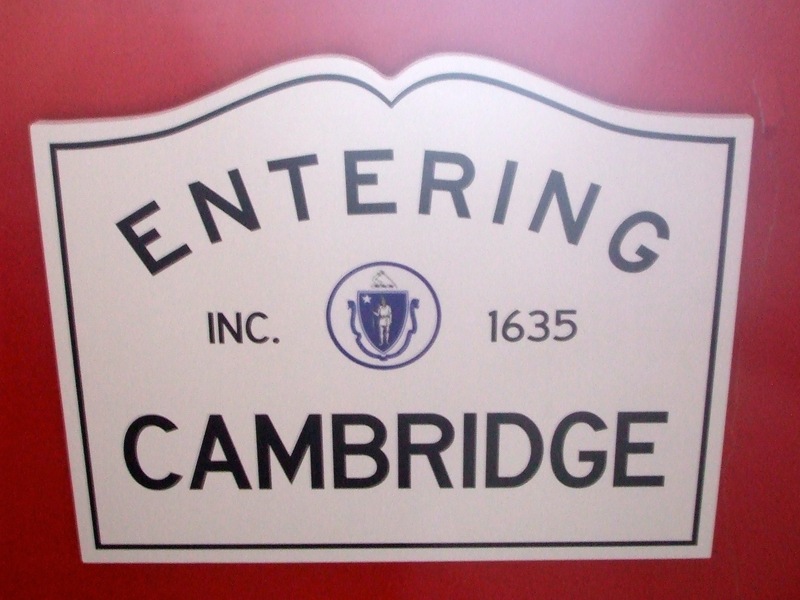 an “entering cambridge” postcard. the very sign we loved, framed on 3-by-5 thick paper. on the back, written in the wee small script of the man i married nearly 22 years ago, were words that made me cry. in part, he wrote that while it might seem odd to give an “entering cambridge” sign as we were leaving, the point was to make it a promise. “we can always be ‘entering cambridge,'” he wrote, “always exploring, learning, loving, growing.” while it helps to be in 02139, he implored that we should enter cambridge even back in 60091. especially back in 60091, the leafy little life that’s ours when home sweet home. in that cyber-cubicle i tucked a host of hyperlinks and emails, all intended to stir brain cells. the poetry foundation (chicago-based) is peppered throughout, as are offerings from northwestern university (just down the lane), the writing center at northwestern, the writer’s theatre, and that stalwart of chicago indie bookstores, women & children first (where one recent summer’s eve, i stood in line with some 300, mostly women, to listen to none other than alice walker read). added just this week, the newberry library, and another fine indie shop, the book cellar, a bibliophile’s dream that offers comestibles along with book clubs. why not a root beer float with your ayn rand, or panini with your proust? a dear friend of mine who returned from a left-coast fellowship a few years back, told me this week that, upon her return to the heartland, she and a gaggle of friends hired a humanities professor from the university of chicago, and for $100 per person per semester, they carried on in her living room several years of dedicated study of the history and literature of significant chapters of civilization. so here’s where you come in, chair people. because i promise i wouldn’t prattle on if this wasn’t winding back to you. i’ll be recasting the chair a bit, continuing on the adventure of “entering cambridge,” but finding ways to do it even when 997.5 miles from the vaunted 02139.
rather than rambling just from the heart, i will be more inclined to take us on adventures, introduce characters i meet along my ways. some weeks i’ll simply indulge in what i call “marginalia,” peeking onto pages where we find scribblings in the margins of whatever great reads land before our eyes. other weeks, it could be “yellow highlights,” great lines from literature and longform narrative unspooled here for your reading delights. it would be grand if the table could become a gathering ground for whatever percolates your mind, your soul, your appetite for wisdom. and i’ve imagined, too, leaping out of the virtual, and having real-live gatherings of the chair, right here at my old maple table. or, better yet, beneath the whirling fan of the summer porch, where lemony waters are always on tap. over this past year, i carried you all to cambridge in my heart, and in my omnipresent red-flowered marimekko backpack. now i hope to bring you all along as my days of entering cambridge emphatically continue, here along the great lake, the literary home of sandburg and bellow, richard wright and gwendolyn brooks. what are some of your favorite haunts, preferred routes for cerebral exercise in the corner of the world you call home? What a great idea, BAM! This is far from the shores of the Great Lakes, but I do find wit, wisdom, and escape when I take the time to read Shakespeare. Many of his plays are universal and timeless. this, a rainy summer’s afternoon in her vermont garden, as filmed from her porch during tea time. Wow, bam, you mind is whirring faster than the wheel on my electric meter. The mention of the Bard made me think of the Shakespeare garden on the NU campus, and your note on the video from TT’s porch clinched it. For those who haven’t been, this hidden gem is on Garrison, I think, on the lake side of Sheridan. Follow the path around the tiny chapel and to the left and you’ll enter a real secret garden, designed by Jens Jensen, no less. It’s strange that one of the founding practitioners of native landscape architecting was asked to design a formal garden, but he was the plantsman of choice on the North Shore. Many of the traditional plants in a proper British Shakespeare garden just won’t tolerate our Zone 5 (now 6 as we warm?) winters, so he relied on some of our native species instead. (Does someone want to do a Google search for “purple coneflower” in all of Shakespeare? Never mind–our natives didn’t do the reserve commute into English gardens until Jefferson’s time, I think.) It might be the worse for the heat right now, although I held a birthday picnic for a friend there several Julys ago. It’s a lovely flowery glade for strolling, investigating and relaxing. a birthday picnic in jens jensen’s shakespeare garden? holy moley. that sounds heavenly to me (of course i am a winter baby, so a birthday picnic is positively revolutionary), and moreso, ms electric meter, you sound like the sort of friend to be treasured till the end of time. how lovely of you to whip up a fete like that. were all courses bard-themed? the catskillian line there, with the accompanying ba-da-booom, would be: must have been a midsummer night’s dream. I love so many things about this post, bam. The promise of the ENTERING CAMBRIDGE sign, the ritual of the passing of the spice box during the sabbath blessing, and the idea of the gathering ground are all beautiful images. I’m going to try to find the Shakespeare Garden (maybe even today!) at NU. Bookstores and libraries are two of my favorite places. The Book Cellar is lovely, but I’m ashamed to say I have never been to Women and Children First (I don’t know how that has not happened). Some of my other treasured spaces are the Chicago Botanic Garden, the lakefront, and Old St. Pat’s. And I’ve been wanting to walk a labyrinth. I know there’s one closeby at St. Scholastica’s, but I’ve never explored it. I am grateful for your words here. They are an inspiration for me to go do some exploring on my own and to share some exploring with your gathering ground. Hi BAM, I think part of your message to us and to yourself is to always be in the mindset to “enter Cambridge”–take advantage of the opportunities our circumstances present us, even if it is looking at the sky while at a traffic light and being inspired by a cloud formation. When we are offered something to do, or someplace to go, don’t have an initial reaction be why we can’t or don’t want to. Instead, make time, take a chance, don’t imagine too much why it won’t turn out well, or won’t be worth while. One cool idea for you might be the 3-hour Chicago Food Planet architecture and eatery walking tour of Bucktown and Wicker Park. Lots of information, and tastes. In fact, it is very easy to think like a tourist in Chicago–keep eyes wide open for all of the experiences you availed yourself of in Cambridge because you had role to be open, not settled. Good luck! Ah, were it that we were our vacation selves at home. With this beautiful post, you remind me. I am full of enthusiasm upon reading this and see how the classes you took have crept into your being, grown you, inspired you. And now you want more of that and your post nudges at the part of me that wants more of that, too. I love your idea of a reading circle and have no idea why I share your allergy to book clubs. I look forward to exploring more and reading more — of both recommendations I discover here and of your new adventures in writing. For walking adventures I have just begun to discover paths around Fort Sheridan. There are secret beaches and cliffs, woodlands, prairies. Too, there’s an old razed estate in Highland Park with a gazebo that still stands and a path high above the water’s edge that ends at Ravine Beach. Fairly stunning. a razed estate sounds so intriguing. laced in mystery. where did it go? why? who dwelled there? i love wondering those things, without actual answers…..
How about a few answers, but not all? Millard Park was once part of the Schaffner estate with a home designed by Howard Van Doren Shaw in 1909. Henry Floriani originally designed the gardens. The Park District of Highland Park acquired the land in 1969 and the house was demolished in 1982. In 1987, the Junior League of Evanston-North Shore approached the Park District of Highland Park to restore the garden in Millard Park. In 1990, local members of the Garden Club of America took over the garden’s maintenance. The garden was dedicated to Robert C. Schaffner in May of 1991. Since 1991, the Park District of Highland Park has maintained the garden. Millard Park is named after Everett L. Milllard who was an early Commissioner and President of the Highland Park East Park District. Voted Best Secluded Picnic Spot by Chicago Magazine, August 2001. Millard Park is 14 acres of ravine, bluff, and shore habitat. Ravines offer cooler climates for plants and animals. Pointing my old car in that direction. Just enough answers to further entice…. Practice the arts of attention and listening. Practice renewing yourself every day. Practice meandering toward the center of every place. Practice the ritual of reading sacred texts. It is a good cerebral and heart guide whether on the road or at home. The lakefront is always, always my place for renewal as it continually reminds me how grand and ever changing the world is. The wild bird preserve at Montrose Harbor, a.k.a The Magic Hedge, is also a wonderful place to experience nature in the middle of this crazy wonderful man made city. PS Love the idea of a literary circle…. i am continually amazed at the power of the chair people to bring forth — bubble forth — bits of wisdom i wonder how i lived without…..i love the art of the pilgrimage, the practices…..another title to add to my bookshelf. “meandering toward the center.” that one, in particular, draws my curiosity and attention….. thanks, lc. Instead of a book circle, a book labyrinth, whose winding paths are one path, whose twists and turns send us back the way we came, but not along the same footprints, only it’s not back at all, but meandering toward the center, and out into the world again. So of course, my favorite haunts are trails with a mystery or a surprise, or that make me feel like I’m in a book. The old roads at Ryerson Woods, Ragdale from the back at Open Lands, a camp by the lake. Cerebral exercise, the same! a “Wikipedia vortex”, you know, where a snippet overheard leads you to the library, and a not-so-chance encounter, and a new direction. If getting lost in the woods or the vortex adds another book to the tottering pile bedside, so much the better. YOU ARE SOOOOO HEAVENLY. and oops didn’t mean to shout, was locked in caps lock. but i love that labyrinth. indeed, that’s what we must have……. Labryinths are a traditional part of the pilgrim path so ‘notherbarb’, this is brilliant. The pilgrim meanders and winds down the road, it is never straight and open. There are blocks, challenges, frustrations, “hitting the wall” and even despair sometimes. Yet, then there is that sudden opening path, clear light, renewed confidence, and inspiration as the pilgrim moves toward center and soul. Books are wonderful companions (along with excellent “chair companions”.) I love the “not so chance encounter” as it embodies the intuitive wisdom a pilgrim finds on the path in encounters with others. Library and Labryinth have such a lovely ring when put together. Grateful to be at table with wonderful companions. me too, so grateful. so so grateful for a labyrinthine table….